Tissues are a luxury at my house. If anyone in my family were to get a runny/bloody nose they would run to the bathroom and use some good old fashioned 2 ply toilet paper. Though my 2 year old had a cold recently, and the toilet paper was giving her a rash and giving her a lifelong dislike for wiping her nose, so I bought some of these. She was instantly grateful that it was the furthest thing from sandpaper. For kids I would absolutely recommend them. They smelled a little funny for my taste but the relief is worth it. 4 stars. My red, sensitive nose can use all the soothing coolness it can get. 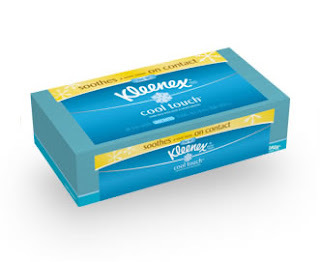 Thank you Kleenex for continuing to push the envelope of tissue technology. 4 stars. Quick Hits average of 4 Stars! !